After only one day of being listed on Club Nintendo the exclusively special Gold Nunchuk has been completely sold out once again. Hopefully those of you planning to get one this time around managed to get your order accepted and are only needing to wait for the mailman to come to your home and hand you your hallowed package. If you were unfortunately one of the many that missed out then don’t be too upset; Nintendo of America has announced some great news! After the new year, Nintendo of America plans on bringing back the Gold Nunchuk for the third time which should please at least a few readers! Discover some more details after the break! As Nintendo of America is encouraging, now is the time to save up those 900 coins needed in exchange for this valuable controller. 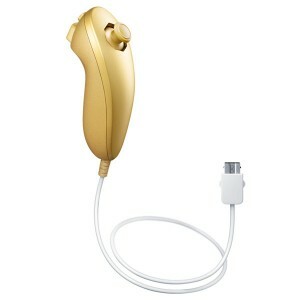 Prepare early because you don’t want to miss out yet again and the Gold Nunchuk is a perfect addition alongside your special Zelda Gold Wii Remote. You can view the Gold Nunchuk by clicking here! Did you manage to order a Gold Nunchuk before they sold out? If not, will you have enough coins before the next allotment comes in? Is the Gold Nunchuk worth trying to order? Let us know your thoughts and opinions below!